When you think of the dangerous animals that we share the earth with, your mind typically springs to sharks, then to lions, and then all the innocent-but-deadly, cartoon-looking creatures you've seen on Planet Earth. What you don't think of, probably, are mosquitos. But with the insects so often the carriers of vector-borne diseases like malaria, dengue fever, the Zika virus and Lyme disease, they cause over a million deaths each year, according to WHO data. 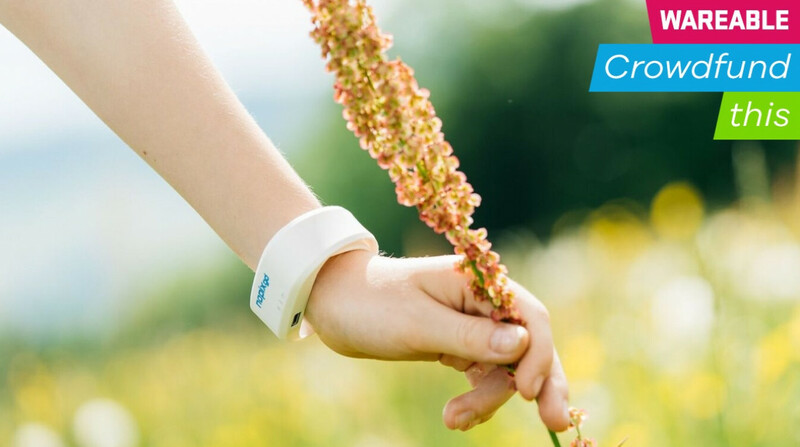 The need for a solution has never been greater, and one Swiss startup is taking aim at the mosquitos not through traditional methods like chemical sprays, or even ultrasound, but with a wrist-worn wearable. Nopixglobal's device draws from scientific testing in order to improve protection against mosquitos, leveraging the insect's own survival instinct against it by recreating the same atmospheric conditions produced by thunderstorms. By doing so, the mosquito's instinct to feed is overridden and the rate at which it bites is said to vastly reduce. The unorthodox technology is currently on Kickstarter and available from roughly $70, with the company looking for backers to help propel its wearable mosquito protector into the world and fund further testing of its method on the more than 3,000-strong variants of the insect. "Usually, a mosquito will follow the exhalation of a human or animal from above before flying down and looking for blood vessels to attack. But when the band is on, we find that the electromagnetic signal helps activity to slowly subside, and the mosquitos instead begin to fly towards the floor and wait out what it thinks is a thunderstorm," Nopixglobal's Johan Niklasson told us. "We don’t want people to think this offers 100% protection – it doesn’t do that just yet – but we do often see a very significant reduction in bites. For example, if I’m in a controlled testing room that's filled with mosquitos for 30 or 40 minutes, I could come out with just five or six bites, and that’s unheard of." The reason why Niklasson indicates that further testing is vital is due to the amount of variance between different species of mosquitos. For example, while the Nopixglobal team has been able to tune the frequencies of its wearable to insects typically found in Africa, where mosquitos have the innate quality to try to survive thunderstorm-like conditions or heavy winds, others aren't programmed in quite the same way, and therefore require a higher frequency. Why not ramp up the signal's frequency universally? Well, doing so risks killing mosquitos in a wearer's path and therefore harming the ecological balance. In Niklasson's apartment hangs a map of the globe, with scores of pins all across the continents of South America, Asia, Europe and Africa – though none for Antarctica, of course – indicating where the Nopixgo device has been tested by real-world users over the past two years. He says that this, as well as continued testing in the lab, will help the company forge its path to eventually creating an affordable mosquito repellant that can last for several years at a time. But there are also other factors in play that could affect its mission to tackle the mosquito problem. "There is a bit of a conflict between us and the other guys – these people who work within chemical aids, or ultrasound," says Niklasson. "I think we're considered disruptive, because the pharmaceutical and chemical industries are very strong in Switzerland, and the World Health Organisation is in collusion with these very large companies because an enormous amount of money is changing hands. "At least from what we can see, these organisations don’t want any competition. We’ve basically been ignored by the World Health Organisation, and so for this to reach people we’ve realised we’re going to have to do it ourselves." Niklasson says the team was initially naive to the forces it believes now work against it, with money instead being more routinely ploughed into potential vaccinations, and testing for its own technology facing harsh stipulations. "The crucial thing to consider about mosquito protection is that you can’t actually make a mosquito fly away entirely, and things like ultrasound work for a time before they realise it’s not actually harmful. The World Health Organisation, though, stipulates that a device doesn’t technically work unless a mosquito is repelled, and flies away from whatever is protecting you. It doesn't make sense." At first glance, it's natural to question the need for a dedicated mosquito wearable, but there's a far-reaching and long-term plan in place for the Nopixglobal team that's not typical of every project. By Niklasson's own admission, this isn't a one-off device that will conquer the mosquito issue once devices are shipped. In fact, it's quite the opposite, with this representing the first step on a path that includes reducing the cost of its device and improving its battery life to last years, not days. Different types of devices harbouring the same technology are also being planned, including modular tags that can clip onto a backpack, solar-powered wearables and even hubs that sit within a home. Essential reading: Wearables vs killer diseases – who's winning? As with any new technology, it's always sensible to exercise some caution before backing, but this does represent an intriguing way to to combat a problem that is felt, to varying degrees, across the globe. The immediate target here is the people who find the chemical-based mosquito repellants a bugbear during the summer and want a new way to reduce bites, but the bigger picture is that this is something that could grow into something much meaningful. We'll be testing out the wearable over the coming months to get a gauge on just whether it's able to do what it claims, so stay tuned for our full take.